The poll scenario of 2019 has taken a new turn. The BJP was expecting a fractured opposition without any proper coordination. However, this did not come true. The Opposition is more united than ever, but the shape of this unity is different. The Congress which was trying to become the leader of a united Opposition failed to acquire the leadership. It is certainly giving comfort to BJP. But this has hardly lessened the intensity of opposition to the saffron party. Most of the non-BJP and non-Congress parties have joined hands and the alliance has many former BJP allies in it as well. The poll equations that have developed across states is also no so comfortable for the BJP. In most of the states, BJP will be facing a strong Opposition. 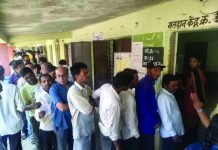 The scenario of triangular contests in many states also does not seem to be favoring the ruling party led by Narendra Modi and Amit Shah. 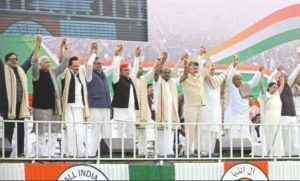 A superficial observation will make one believe that exclusion of Congress from the conglomeration of opposition parties is a failure of the party to mobilize anti-BJP political forces BJP under one umbrella. A close look will, however, reveal otherwise. Was it really a weak initiative on the part of Congress that sent the party out of a poll alliance? Are the opposition parties really keen in keeping the grand old party out of a non-BJP poll front? Political developments of past few months speak a different story. It is amply clear that it is Congress which wanted an anti-BJP poll alliance without being an actual partner of it. It only wanted to sustain a strong anti-Modi narrative without being a part of a functional non-BJP formation. In fact, the party had different strategy. It wanted create an independent appeal. Rahul Gandhi tested this strategy in recently held assembly elections of five states. If we go into the complaints of Samajwadi Party and the Bahujan Samaj Party that the Congress ignored them and made no effort of poll alliance in assembly polls, we can get some insight about the pattern. Some media reports even reported that personal communication between Akhilesh and Rahul Gandhi was no more in existence when these states were undergoing elections. They highlighted that the communication were actually snapped just before the assembly polls and Akhilesh felt hurt by this sudden change of gesture by Rahul Gandhi who he considered as a close friend. Similar complaints were made by BSP as well. The party said that the Congress did not seriously discuss the alliance. These allegations show that the Congress was determined to go alone in the assembly polls. Congress probably wanted to beat the narrative that it had no choice but to embrace parties like SP or BSP. The party had also to reduce its over-dependence on these parties in Lok Sabha polls. People may argue that these parties were of no consequence in these states. However, facts do not support it. The BSP had considerable presence in three Hindi-speaking states of Rajasthan, Madhya Pradesh and Chhattisgarh. In Chhattisgarh, the BSP with Ajit Jogi’s party was even a formidable third force. The social alliance that had emerged after two parties joined hands was really strong. Congress president Rahul Gandhi, in fact, gambled by ignoring it. However, came out successful. Congress strategy in states in assembly polls was to place the party as a party which could gain support of all the sections of the society. In fact, the party was eyeing votes of the upper castes which were angry with the BJP over the issue of anti-atrocity laws. Going with the BSP might have alienated these votes. The strategy worked well and the Congress could make a dent into the upper caste base of the BJP. Rahul has built up his strategy for 2019 poll on the experiences his party has gained in assembly polls. The core of his strategy is to create an independent Opposition narrative with the Congress in the center. He is claiming his party is fighting a battle of ideology against Prime Minister Narendra Modi. This alternative narrative of Modi’s opposition has governance, economy and corruption as core issues. Most of the Opposition leaders have limited their critique of the current regime to regional issues with local appeal. If Chandra Babu Naidu is complaining that his demand of special status to his state is being ignored, Mamata is complaining of dividing the state on communal lines and giving inadequate economic aid, Kumarswamy is also taking up same issues. The common complaint from these regional parties is that the Modi government has unleashed a vendetta politics and is using government agencies to target the Opposition. Though, issues like GST, demonetization and farm distress form part of the overall Opposition attack, no comprehensive narrative could be built around them. The SP and BSP, the two giant parties of Uttar Pradesh which returns 80 MPs to Lok Sabha, are apparently opposed to the economic policies of Modi. However, their opposition is limited. They only make it a part of their election manifesto. In reality, both the parties confine themselves to the issues that are relevant to the political or social needs of the state. They mostly attack BJP on governance issues and target Chief Minister Yogi Adityanath. Even issues like mob-lynching and cow-vigilantism have regional relevance for them despite the fact that these issues are national in nature. Rahul has been able to put forward an alternative narrative which is comprehensive and national in nature. He is placing a different form of governance before the people. That is why he is highlighting select programs of UPA like MNREGA and stressing a pro-poor agenda of the Congress. May be it is revival of Indira Gandhi’s ‘Garibi Hatao’. He is attacking Ayushman Bharat program on the ground that it is meant for helping insurance companies and promising to improve conditions in government hospitals to make public health system efficient. He is attacking the education policy of the government that it has made education beyond the reach of common man. 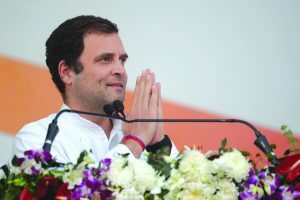 “The monopolization and capture of education and healthcare system, and the idea that a middle-class person has to pay lakhs of rupees to get decent education needs to be challenged,” Congress President said in a public meeting in Orissa. His criticism of these issues are in consonance with his attack on the “pro-corporate policies” of the government. His targeting Modi government on the issue of farm-distress helped him win the states of Rajasthan, Madhya Pradesh and Chhattisgarh. Implementation of loan-waiver in these states will help him in claiming that he is true to his commitments. His attack on the government over the issue of using investigating agencies is not centering on vendetta politics. He relates it to collapse of important institutions in the country. He stresses how the Modi government has devalued judiciary, Reserve Bank ad and all other institutions. Rahul also relates the alleged corruption in Rafale deal to the collapse of institutions. 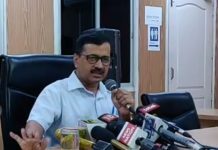 He says Prime Minister ignored the procedure to finalize the deal and helped a business house to earn thousands of crores. 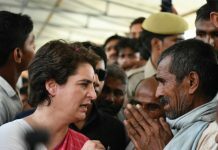 Will an alternative Congress narrative be effective in 2019 polls? Will a divided Opposition be able to counter Modi? A close look at the social and regional equation reveals that Congress as a third alternative may be an effective way to counter the RSS-BJP. At many places, a direct fight may help BJP. The experience of assembly elections shows that Congress is capable of gaining upper caste votes. In Uttar Pradesh too, the votes of non-Yadava OBC votes and non-Jatav Scheduled Caste votes could go to BJP. In 2014, the BJP gained a sizable amount of votes from these sections. This time, the Congress can divide these votes. In other states too, there is same scenario. The only danger with Congress as third alternative would be a division of Muslim votes. This could be countered by coming out with a proper strategy. This is possible because none of the regional parties of anti-Modi alliance is opposing Congress. They have affirmed that the Congress was very much part of the anti-BJP fight, even if there would be no seat sharing with it. The SP and BSP are particularly conscious about the possible fallout of attacking Congress and are refraining from it. The Unity Rally in Kolkata has, in fact, disapproved the stance of some parties to exclude the Congress from the broader anti-BJP platform. The idea of maintaining an equal distance from BJP and the Congress. The proponent of this idea, K Chandrashekhar Rao miserably failed in his attempt to make a third front by keeping both BJP and Congress out of it. NCP leader Sharad Pawar and National Conference leader Farooq Abdullah were opposed to the idea of Federal Front from the very beginning and made Mamata Banerjee and others to disapprove it. Now, there is a simple formulae that the regional parties will be free to choose their poll allies with or without the Congress. In all likelihood, the Congress will have alliances in some major states like Assam, Bihar, West Bengal, Maharashtra, Karnataka, Andhra Pradesh, Telangana and Tamilnadu. 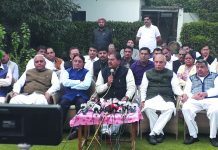 In some states, It will be a third alternative and in other states like Chhattisgarh, Madhya Pradesh, Rajasthan and Gujarat, the party will be in direct fight. “We want a democratic state. It will be chaotic but we bring all sections together and create discussions amongst them,” Rahul said in a public meeting. Will Rahul become a real alternative? Only time can say.